Lovingly known as "St John's Barefoot Minister,"Anne Marie Porter has lived on and loved St. John in the United States Virgin Islands for over 33 years. She feels very blessed to live in one of the most magical places on the planet and be with people on one of the most important days of their lives. 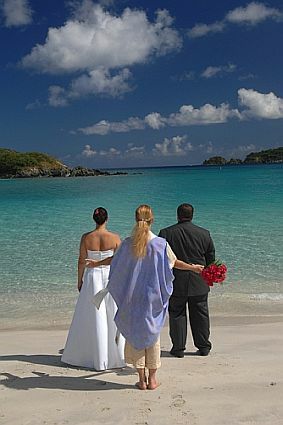 "Couples come to the USVI for their wedding because it is easy, romantic. and fun" says this most popular wedding coordinator. "If you do only one thing for your St. John wedding, pick Anne Marie Porter as your wedding officiant. She is amazing. The ceremony was beautiful and meaningful and felt perfectly fit to us. Anne Marie is so helpful, so genuine, so good at what she does, and seems to enjoy her work so much that it isn't like work at all. I was very worried about picking someone I didn't know off of the internet and sending her $400. I'm skeptical by nature, but I can promise that you don't have to worry about that in this case. Pick her. You will be so glad you did - in every facet of your wedding planning, but especially on your wedding day. We planned our wedding about six months in advance since it was a just-the-two of us event. I am very organized and like everything planned carefully. Anne Marie catered to this, even though everyone else in St. John is on island time. Anne Marie either picked up her phone or returned my calls immediately. She was responsive to emails, questions, concerns, requests for recommendations, etc. I really put her to the test when I panicked the night before a 9am wedding about transportation. (We thought getting a taxi in St. John would be like it is at home in Colorado, but it's different. The taxis are vans and they usually wait to fill up the whole van before taking you to your destination. I was worried that we wouldn't be able to get to the ceremony in time.) Anne Marie answered her phone at 9pm and calmly listened and offered me multiple options. We found a solution that required her flexibility, and she made the accommodation like it was nothing at all. But it was a huge deal! I slept so much better that night and truly had the most beautiful, peaceful wedding that I could have imagined. The ceremony was perfect. The location Anne Marie helped us pick was perfect. I cried through the entire thing (which was unexpected to me) in large part because of how special Anne Marie helped it to feel and the amazing words she said."